Lititz, PA-July 2018... The rumor is false that when prehistoric fish first crawled onto land, Clair Global was there to provide the sound system and technical expertise. It only seems like the legendary production company has been providing tour, festival, broadcast, and corporate event support for 400 million years. But should a fish attempt such a feat today, Clair Global may well be present to record the sound of the event with a TASCAM DA-6400 64-track digital recorder and archive the stereo mix with a TASCAM SS-CDR250N CD player. 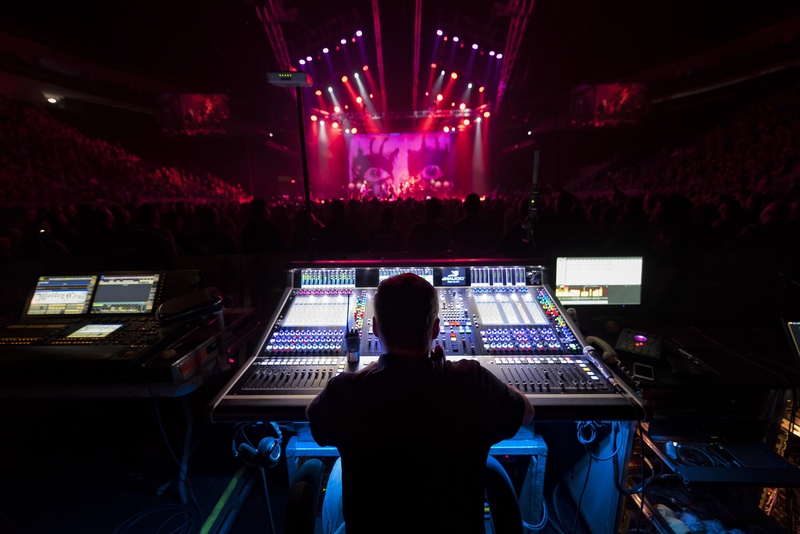 "Nowadays multitrack recording is a big deal for concert tours," observes Clair Global Senior Director-Systems Development Harry Witz. "Some people bring out full DAW rigs, but that's a lot of space and weight. Some record to a laptop. But I prefer dedicated hardware, and using the TASCAM DA-6400 is simple, convenient, and reliable. It's 1U rack-mount, and you're setting up your rack and your console at a gig anyway. It's available with Dante or MADI cards; I use a lot of DiGiCo products, so I got a MADI card. Hooking it up is dead easy: Connect two coaxial cables into the input rack of a DiGiCo, and it's up and running." You have to adjust a few settings on the front panel to get it to talk to the console, Witz acknowledges. "But once you know what to do, it's pretty simple. Then you just hit Record. That's it; you don't have to deal with anything else until you're done. You don't have to get out cables and your converter, find a place to set your computer so you can see the screen, make sure you have power, and boot up the computer." Once up and running, Witz notes, "it automatically tracks the inputs from the MADI rack. You can set up the little metering section on the front so that it's easy to see that you have input on everything. You can even see that you have live mics without looking at the board. It has a caddy with a hot swappable SSD drive, so if you fill a drive, you swap it out and keep going." When finished recording, Witz connects the DA-6400's USB 3 port to a laptop and downloads the files. "It's quick," he asserts. "A two-hour show downloads in just a few minutes." When testing the TASCAM DA-6400, Witz recorded a half-dozen bands in genres ranging from Irish folk music to heavy rock. "The first thing I noticed is, the thing's dead quiet," he reports. "I've listened to DA-6400 tracks in my home studio, and they're as high quality as anything I've ever heard." For one high-profile Clair tour, Witz was preparing to mix some dates the regular engineer couldn't make. "I watched the show so I knew what was going on, recorded it on the DA-6400, brought the recorder back to the shop, plugged it into a DiGiCo SD10, and used it to mix the tracks on the board," he recollects. "It worked great for that. How much easier could it be than a 1U rackspace recorder that does 64 tracks at 48 kHz? Another of our engineers and I both gave the DA-6400 a thumbs up, and it's now on Clair's 'approved' list." At Clair Global, multiple engineers are responsible for testing new equipment. Senior Director of Engineering Howard Page assessed the TASCAM SS-CDR250N two-channel networking CD/media recorder. "For worldwide concert tours, we always need a reliable and easy-to-use way of archiving the shows to a medium-or multiple media-that is instantly transferrable to many situations," explains Page. "The SS-CDR250N unit fills that need perfectly. I use the SS-CDR250N to record full archive recordings of all of my live shows." Previously, Page used TASCAM CD-RW901 CD recorder/players. "My custom CueController program for Windows PC was rewritten to take advantage of the complete RS232 remote-control capabilities of the CD-RW901," he recalls. "Artists and band members really appreciated the results, as they could get a CD disc of a show with not only the venue and date of recording but also fully named and ID'd tracks." The SS-CDR250N enabled Page to take advantage of the latest advances in technology. "Bands and artists want a more flexible format to instantly download into their computers," he observes. "Like the CD-RW901, the SS-CDR250N offers RS232 control, and it has exciting new features, like backup recording, the ability to upload files to a server, and many more great features that make it ideal for our purposes. Initially the SS-CDR250N firmware was not fully compatible with what the CD-RW901 was able to do but thanks to outstanding firmware development by the technical guys at TASCAM in Japan, the SS-CDR250N now interfaces perfectly with my CueController control software." Page's show control software has too many elements to detail here. Suffice it to say that, used with the TASCAM SS-CDR250N, the end result includes a full archive recording with all tracks ID'd, including song titles, where it was recorded, and on what date. Page records simultaneously on both a USB memory stick and an SD card for an extra level of security. Touring pressures have precluded him from using the SS-CDR250N's FTP features to upload files to a server, "but," he states, "I am certainly excited to get to those functions in the future." While features and sound quality are crucial for Witz and Page, it's imperative that gear holds up under the stresses of touring. "The DA-6400 has been absolutely reliable," states Witz. "The SS-CDR250N has performed flawlessly so far," Page adds. And that's no fish story.